The complete set of LKG Worksheets in India based on all syllabus and boards (CBSE, ICSE, ISE SSC, Cambridge etc). Page1: An assortment of shapes in the form of dots. Your child has to connect all the dots in a sequence to complete the shapes with a pencil. Page2:A variety of shapes and designs in the form of dots. Your child’s task is to connect the dots in a sequence and complete the shapes with a pencil. Page3:Letters from ‘A-H’ in the form of dots. The dots have to be connected in a sequence to form full-fledged letters by your child with a pencil. Once that is done, repeat the sequence 3 more times without the dots. Page4:A group of pictures and the first alphabets in their name. 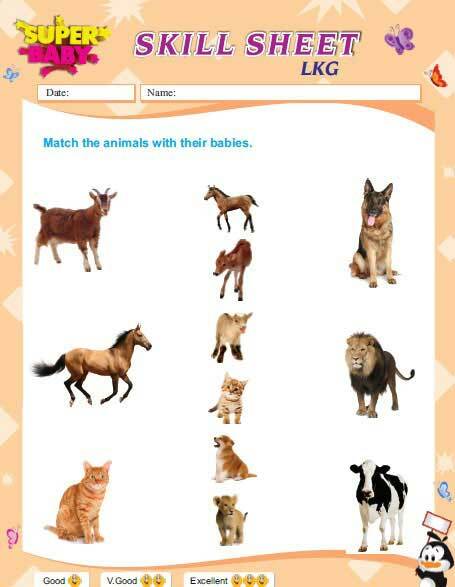 Your child’s task is to match the pictures with the right alphabets. Page5:A variety of pictures and 3 alphabets beside each one. Your child has to identify the correct first alphabet from the name of the picture and then circle the right one from the 3 options provided. Page6:A sequence of letters starting from ‘A’ to ‘H’. Your child has to fill in the missing letters in the empty fields. There are also 3 pictures. The picture(s) that start with the letter ‘G’ has/have to be circled by your child. Page7:Letters from ‘I-P’ in the form of dots. The dots have to be connected in a sequence to form full-fledged letters by your child with a pencil. Once that is done, repeat the sequence 3 more times without the dots. Page8:A group of pictures and the first alphabets in their name. 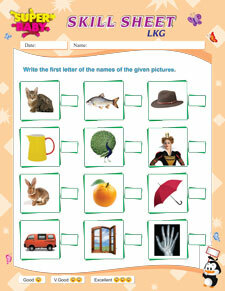 Your child’s task is to match the pictures with the right alphabets. Page9:A group of pictures with empty fields below them. Your child’s task is to write the first letter of the pictures in the empty fields. Page10:An incomplete picture with numerous dots or markers labeled from ‘A-P’. The dots have to be connected in the correct sequence by your child to complete the picture. Page11:Empty fields where your child has to write letters from ‘A-P’ in the correct sequence. Page12:Letters from ‘Q-Z’ in the form of dots. Your child’s task to connect the dots in the correct sequence to form fully-fledged letters. Once that is done, he/she has to repeat the same sequence 2 more times without the help of dots. Page13:A variety of pictures and the first letters from their names. The letters have to be matched with the correct pictures by your child. Page14:A variety of pictures and 3 alphabets beside each one. Your child has to identify the correct first alphabet from the name of the picture and then circle the right one from the 3 options provided. Page15:Empty fields where your child has to write the letters from ‘A-Z’ in the correct sequence. Page16:An incomplete picture with numerous dots or markers labeled from ‘A-Z’. The dots have to be connected in the correct sequence by your child to complete the picture. Page17:A variety of pictures with an empty box beside each one of them. Your child’s task is to write down the first letter of the names of the pictures in the corresponding empty boxes. Page18:Letters from ‘A-H’ and ‘a-h’ in the form of dots. Your child’s task is to complete the letters by connecting the dots in the correct sequence and then repeat the letters in the empty fields without the help of dots. Page19:A group of pictures and the first letters in the their names. The letters have to be matched to the correct pictures by your child. Page20:A group of pictures and the first letters from their names. The letters vary from ‘A-H’ and have an empty field beside each one of them. The empty fields have to be filled with lowercase versions of the corresponding letters. Page21:Letters from ‘i-p’ in the form of dots. Your child’s task is to connect the dots in the correct sequence to form fully-fledged letters. Once that is done, he/she has to write the letters in the same sequence without the help of dots. Page22:3 columns: a variety of pictures, the first letters from their names in uppercase and the first letters from their names in lowercase. The uppercase and lowercase versions of the letters have to be matched with the correct pictures by your child. Page23:Letters from ‘i-p’ in a sequence. Some of the letters are missing and hence, have to be completed by your child. Once that is done, she/he also has to connect the dots for the letters ‘I-P’ as well as ‘’i-p’ and repeat them without the help of dots. Page24:Letters from ‘q-z’ in the form of dots. Your child has to trace the letters and then repeat them twice without the help of dots. Page25:3 columns: a group of pictures, the first letters from their names in uppercase and the first letters from the names in lowercase. 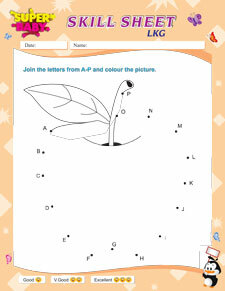 Your child’s task is to match the upper and lower caser versions of the letters to the corresponding pictures. Page26:Empty fields where your child has to write the letters from ‘A-Z’ and ‘a-z’ in the correct sequence. Page1:5 rows. Each row contains pictures of 3 related and 1 unrelated object. Your child’s task is to circle the odd object out. Page2:Outline of 2 animals. The bigger animal has to be coloured and the smaller animal has to be crossed out by your child. Page3:Various contrasting pair of objects based on height. Your child’s task is to circle the taller objects and tick the shorter ones in each pair. Page4:Various contrasting pair of objects based on weight. Your child’s task is to circle the lighter object in each pair. Page5:3 rows of similar pair of objects. The pair is different due to different quantities. 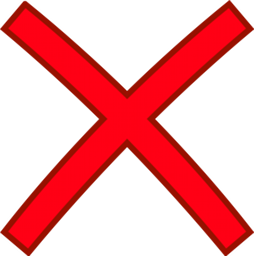 The box containing a larger quantity has to be ticked and the box containing a smaller quantity has to be crossed out by your child. Page6:Various objects. Your child’s task is to colour the tallest object. Page7:2 columns. One consists of numbers from ‘1-5’ and the other consists of objects of varying quantities. 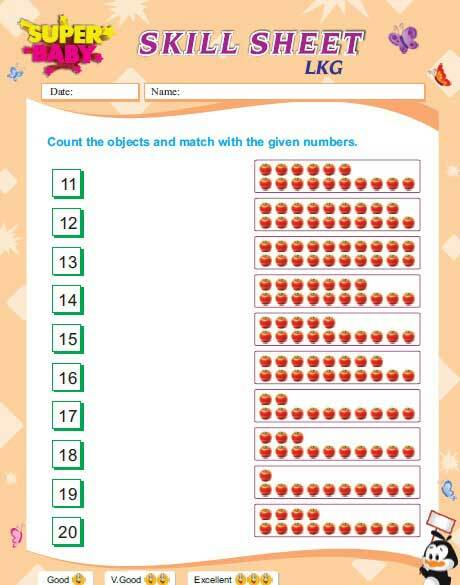 Your child’s task is to match the numbers with correct number of objects. Page8:Numbers from ‘1-5’ in the form of dots. Your child has to trace the numbers and then repeat the numbers in the boxes below without the help of dots. Page9:Similar objects varying in quantity. The objects have to be counted and then the appropriate number has to be written in the box. Page10:Numbers from ‘6-10’ in the form of dots. 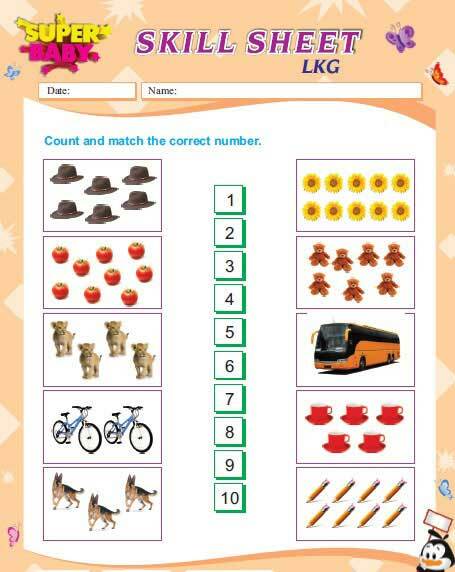 Your child has to trace the numbers and then repeat the numbers in the boxes below without the help of dots. Page11:Numerous groups of similar objects in varying quantity. Your child’s task is to count the all the groups of objects and then match them to the correct number. Page12:Numbers from ‘1-10’ in the form of dots. The numbers have to be traced and then repeated 4 more times in the empty boxes without the help of dots. Page13:A group of similar objects. They have to be counted and the correct number provided below has to be circled by your child. Page14:An incomplete picture with dots numbered ‘1-10’. The dots have to be joined in the correct sequence and then the fully formed picture has to be coloured by your child. Page15:Numbers from ‘1-10’ in numerical form as well as in dotted alphabets. 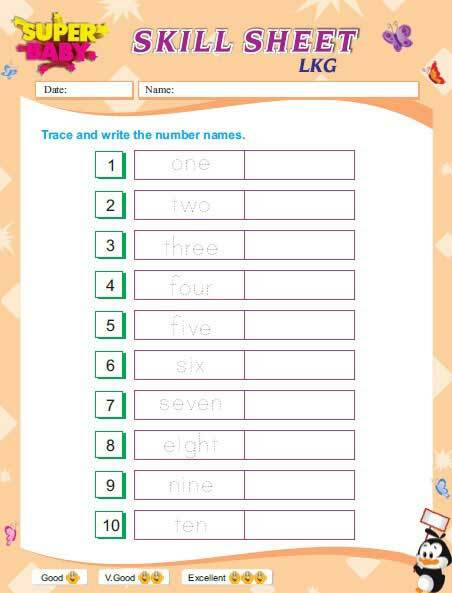 The alphabets have to be traced and then the number names have to be written without the help of dots by your child. Page16:Groups of similar objects in varying quantity. The challenge for your child is to match the objects with the correct number names. Page17:Numbers from ’11-20’ in the form of dots. They have to traced and then written 4 more times by your child. Page18:Numbers from ‘1-20’. Your child’s task is to write them for a couple of times in the empty boxes provided. Page19:Groups of similar objects in varying quantities. 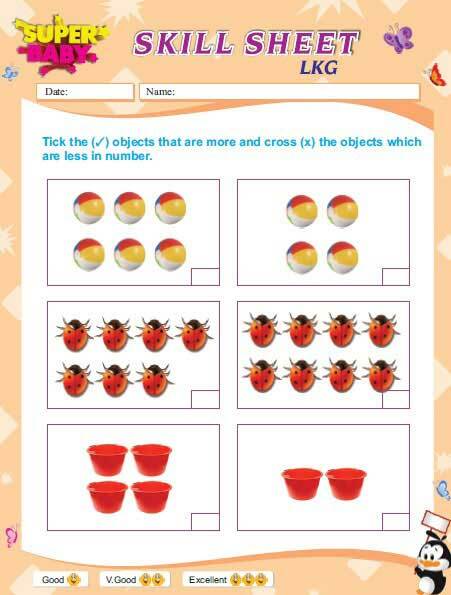 The objects have to be counted and matched with the correct numbers by your child. Page20:A sequence of numbers with certain fields missing. Your child’s task is to write down the missing numbers that come after, in between or come before the hints provided. Page21:Numbers from ‘1-20’. The missing fields have to be filled in with the correct numbers by your child. Page22:Numbers from ’21-30’ in the form of dots. 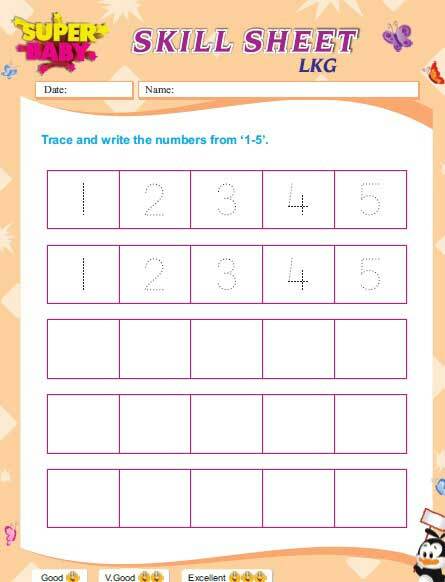 The challenge for your child is to trace the numbers and then write them 4 more times without the help of dots. Page23:Numbers from ‘1-30’. The missing fields have to be filled in with the correct numbers by your child. Page24:Numbers from ’31-40’ in the form of dots. The challenge for your child is to trace the numbers and then write them 4 more times without the help of dots. Page25:Numbers from ’41-50’ in the form of dots. The challenge for your child is to trace the numbers and then write them 4 more times without the help of dots. Page26:Numbers from ‘31-50’. The missing fields have to be filled in with the correct numbers by your child. Page27:An incomplete picture with dotted numbers from ‘1-50’. Your child’s task is to connect the dots in the correct sequence and then to colour the picture. Page28:Empty fields that have to be filled up with numbers from ‘1-50’ in the correct sequence by your child. Page29:A sequence of numbers with certain fields missing. 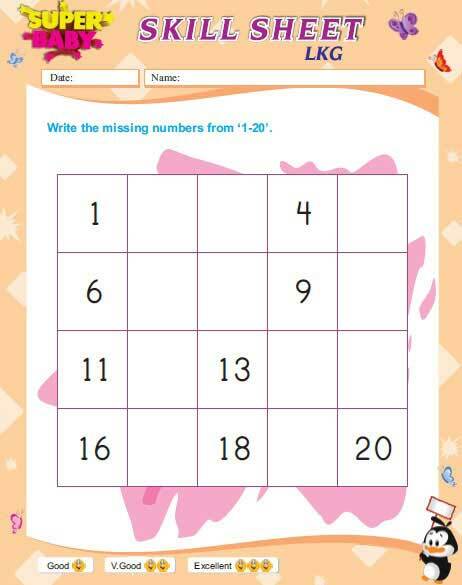 Your child’s task is to write down the missing numbers that come after, in between or come before the hints provided. Page1:2 gender based activities. 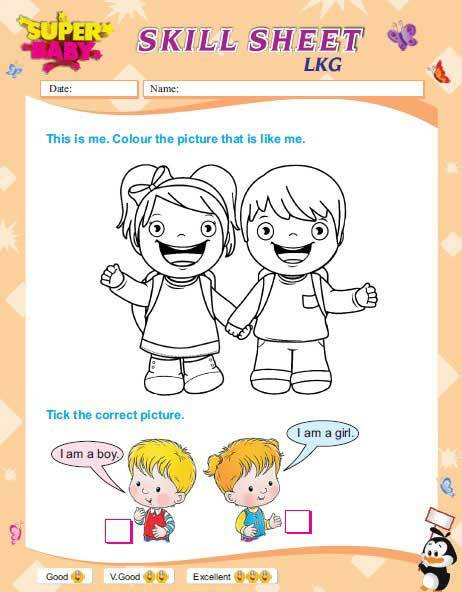 In the first one, your child has to identify the outline that looks like herself/himself and then colour it. In the second one, your child has to tick whatever he/she relates with the most. Page2:Outlines of a variety of toys. Your child’s task is to colour those toys that she/he usually likes to play with. Page3:Rows filled with pictures of various objects. Each row consists of 3 similar and 1 unrelated objects. Your child has to identify and circle the odd object. Page4:2 columns filled with pictures of various objects. One object from each column has a logical relation to each other. Hence, the objects that go together have to be matched by your child. Page5:A picture of a boy and various parts of the body represented in letters. Your child has to match the parts of the body to the corresponding parts of the boy. Page6:6 pairs of pictures that represent parts of the body and an activity related to that organ. Your child’s task is to match the parts of the body with the activities they are related to. Page7:Pictures of various animals. Your child has to circle those animals that she/he usually sees out on the road or everyday life. Page8:Pictures of various animals. Your child has to circle those animals that she/he usually sees or finds in the jungle. Page9:Pictures of various birds. Your child has to circle those birds that can fly. Page10:Pictures of various animals. Your child has to circle those animals that she/he can keep as pets. Page11:2 columns: one consists of various animals and the other consists of various animal homes. Your child’s task is to take animals to their appropriate homes. Page12:Pictures of fully-grown animals and their babies. Your child has to match the babies with their appropriate parents. Page13:Pictures of various animals. Those animals that live in water have to be circled by your child. Page14:Outlines of various fruits. After identifying, they have to be coloured in their real colours by your child. Page15:Outlines of 2 fruits. Your child’s task is to colour both of them. Page16:Outlines of various vegetables. After identifying, they have to be coloured in their real colours by your child. Page17:Various fruits and vegetables with empty boxes beside them. Your child’s task is to identify them all and then write ‘V’ in the boxes beside the vegetables as well as ‘F’ in the boxes beside the fruits. Page18:Pictures of various vegetables. Those vegetables that can be eaten raw have to be ticked by your child. Page19:Outlines of a few flowers. Your child’s task is to colour them. Page20:Outline of a flower whose parts have been tagged into different codes. These codes represent different colours. Once your child is clear about the colour codes, she/he has to colour the flower according to the codes. Page21:Various fruits, vegetables and flowers. 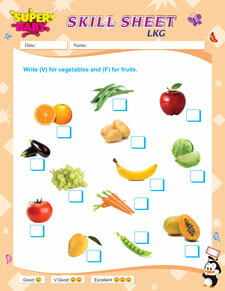 Your child’s task is to identify them all and tick the vegetables, circle the fruits and cross the flowers. Page22:Various means of transportation or vehicles. Your child’s task is to tick the vehicles by which she/he has already travelled. Page23:2 vehicles. Your child has to identify them and then colour the vehicle that can travel on the road. Page24:3 rows that represent 3 distinct ways of transport (land, water & air). Your child’s task is to tick those vehicles that are appropriate for travel by land, water and air respectively.